Fill-your-own ornament Clear glass ornaments ready to be filled are available by the boxful at most crafts stores during the holidays. You can fill them with just about anything –feathers, confetti, pompoms and glitter work well. If you’re feeling more ambitious, create a miniature piece of paper-cut art using a template (and some careful work with a craft knife) and pop it inside for a winter wonderland effect. 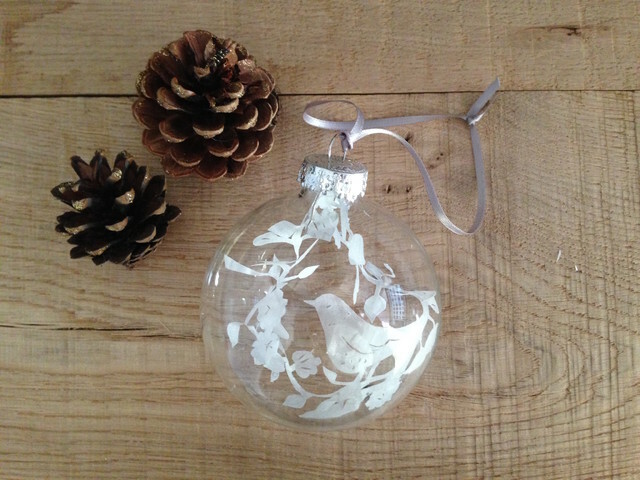 get glass bulbs at craft stores and fill with stuff - feathers, pompoms, confetti or a miniature piece of paper cut art using a template. Fill-your-own ornament. Clear glass ornaments ready to be filled are available by the box full at most crafts stores during the holidays. You can fill them with just about anything — feathers, confetti, pompoms and glitter work well. If you’re feeling more ambitious, create a miniature piece of paper-cut art using a template (and some careful work with a craft knife) and pop it inside for a winter wonderland effect. Fill-your-own ornament. Clear glass ornaments ready to be filled are available by the boxful at most crafts stores during the holidays. You can fill them with just about anything — feathers, confetti, pompoms and glitter work well. If you’re feeling more ambitious, create a miniature piece of paper-cut art using a template (and some careful work with a craft knife) and pop it inside for a winter wonderland effect.